Core Credit Union offers Members the chance to have control over their finances by making their own savings work for them with our range of products & services. It’s the money that Members save that provides the money to lend to other Members. The money you save is held as shares and it is this pooling of shares that creates the loan fund from which you and other Members can borrow. When borrowing, it is important that you borrow wisely ensuring that you protect your shares and the shares of your friends, family and neighbors. 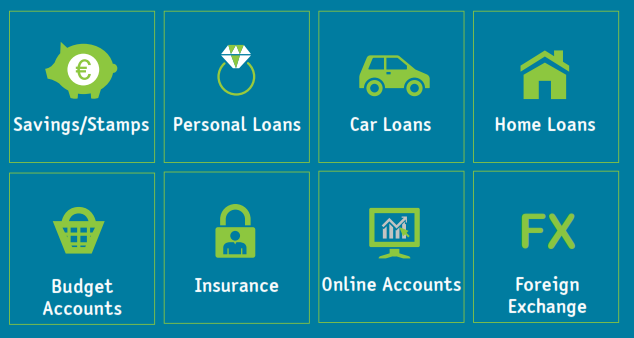 As well as loans, Core Credit Union also offers a range of services including Budget accounts, Insurance, Online access to you account 24/7 and Foreign Exchange. Credit Unions were set up to serve local communities and are not-for-profit. Any surplus made goes towards improving services in the Credit Union, the Community or is returned to Members. To work out loan repayments for the amount you would like to borrow use the loan calculator below or contact one of the Core Credit Union offices.